The problem of plastic in our oceans and other water courses is huge. “Figures show that 8 million tonnes of plastic waste are added to our waterways globally every year,” says Marius, who started the Plastic Whale Foundation back in 2011 to tackle the issue. His first goal was to persuade local companies to help him fish the plastic out of Amsterdam’s canals, using the recovered waste materials to build a boat. When he succeeded, he used the boat to fish more plastic from the canals to build another boat, and so on. 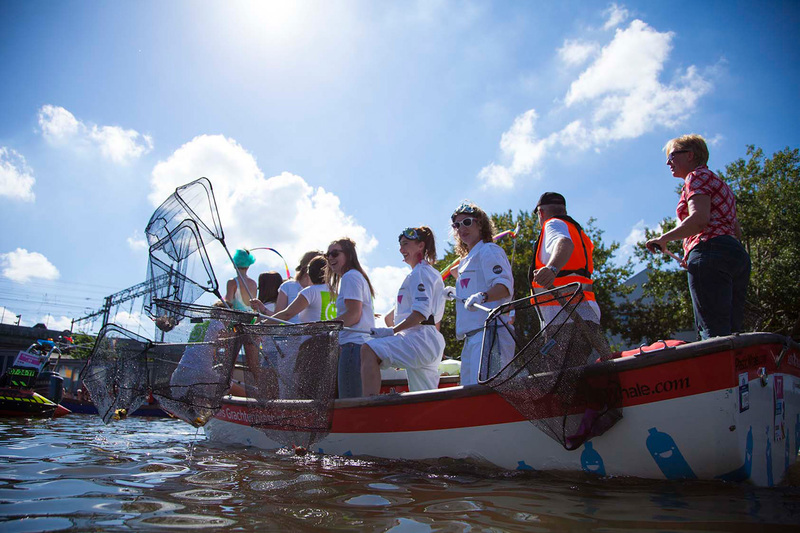 Fast forward to 2018, and the foundation has a fleet of nine recycled plastic boats, while 250 companies participate in plastic fishing activities every year. Not content with this success however, Marius set his sights on establishing “the first professional plastic fishing company in the world” alongside his foundation. 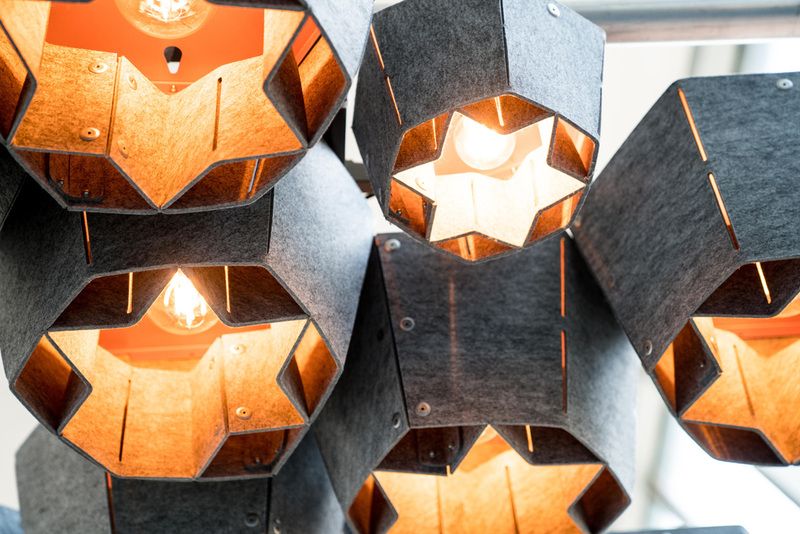 The initial idea, which was to upcycle the plastic waste from the canals into 3D printed objects designed by prominent designers, foundered due to “my naivety concerning the capabilities of 3D print,” says Marius. 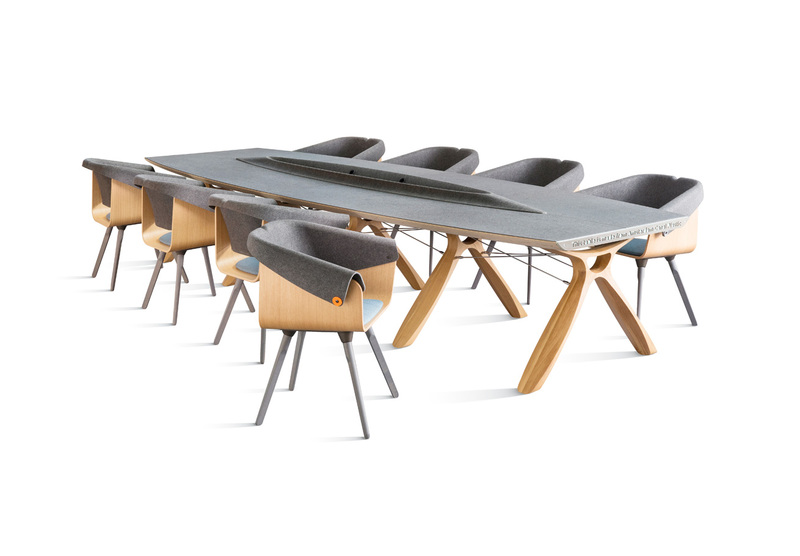 The idea for the office furniture came when a colleague commented over lunch that Plastic Whale’s table was too small, and that the PET foam sheets used to build the recycled boats (and often to make wind-turbine blades) would make a great one. Pursuing the idea, Plastic Whale teamed up with Dutch manufacturing company Vepa to produce the furniture, with designs by LAMA Concept, which took whale anatomy as its creative starting point. “We wanted to move fast,” says Marius. 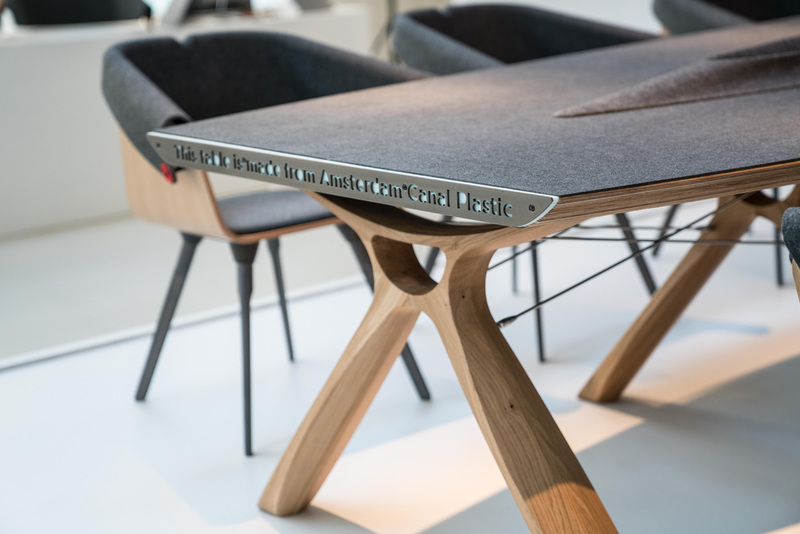 “‘Stop talking and start doing’ became our mantra on this project, and we produced the whole range in just five months.” Comprising a table whose elegant structure recalls whale skeletons, as well as chairs, lamps and acoustic panels, the collection unites recycled PET felt and foam with recycled steel and FSC birch and oat to create a unique look. “Some people ask why the collection isn’t entirely made from recycled plastic, but that would have added many months to the development time,” says Marius. “Also, the combination of materials is beautiful and sustainable, and contributes greatly to the design.” He started up Plastic Whale because “I saw so many people looking to make a positive contribution to the world, but not knowing how,” he says. Fishing the plastic to help relieve pressure on the environment is rewarding in its own right, while seeing it used to make beautiful things “makes contributing very tangible,” he believes. In each table, there are about 1000 bottles, while it takes around 70 to make a chair. As well as using waste materials that would otherwise contribute to pollution, the furniture helps reduce the ‘plastic soup’ polluting the world’s waters in other ways – 10% of the price-tag goes into funding a start-up project in Bangalore that aims to develop a similar recycling model.